The forthcoming corrective of the Copyright Directive was first talked about back in 2016. The head of the European Commission, Jean-Claude Juncker, considered it as a necessary measure to protect intellectual property rights in the “digital age” context. The first edition of the amendments was drafted, and approved by the Legal Committee of the European Parliament in June 2018. However, the public heavily criticized them, and they were not adopted. Only in September 2018, the proposals for the Article 13 was finally approved by the EU Parliament. After that, the clauses of Article 11 and 13 have to go through closed discussions. In early 2019, they would enter into force. What has changed in article 13? Article 13 is devoted to the functioning principles of the popular online services (YouTube, Facebook, etc. ), where users upload their works. Previously, the users themselves were responsible for the pirated video, placed on YouTube. The online-service was not responsible for anything, it served as an intermediary, tracking violations and notifying the right holders about them. Now the responsibility for any user content, that is subject to copyright (video, audio, photo or text), lies with the site where it was uploaded. Therefore, moderators should carefully check all materials, published by users. Matchings will be revealed by the unique algorithms, like the YouTube Content ID. The future amendments in the Copyright Directive caused panic among users. Some people believed that it would lead to the ban of memes, covers, parodies, and challenges, like the Gangnam style dance. 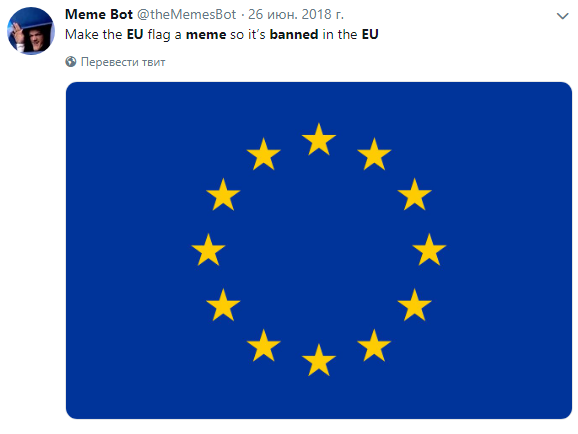 Users even suggested making the EU flag a meme in the protest against the “memes banning”. In this case, the EP would have to ban it too. 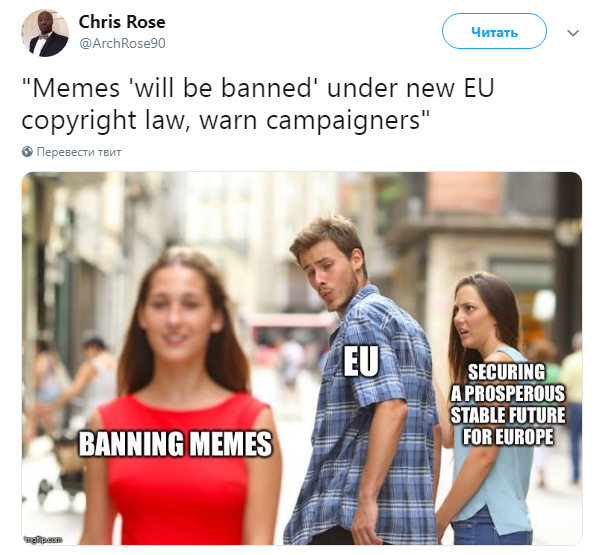 Others were outraged that the European Parliament is struggling with memes instead of solving real problems. Others believed the new article 13 is impracticable since it is impossible to track everything that users upload to the social networks. Moreover, if the robots will check all the user content in social networks, almost all memes and parodies will be banned. Even the most advanced algorithm is not able to distinguish a meme from a copy now. ‘“Article 13 appears to provoke such legal uncertainty that online services will have no other option than to monitor, filter and block EU citizens’ communications if they are to have any chance of staying in business”. Public outrage led to that a later version of article 13, adopted on September 2018, stipulated that the restrictions would not affect the content for non-commercial use. That is, memes and parodies should not be banned. “Copyright law needs reform for the digital age. There needs to be an easy way for creators of content to receive payment from those who have stolen their work. The trouble is, the EU has used a sledgehammer to crack a nut”. On the other hand, many musicians, film companies and publishing houses supported the new copyright measures; they allow copyright holders to get more profit, which used to go away to the hostings owners. The new rules allow authors to “demand” additional fees from site owners, exploited their content. To sum up, the majority of supporters and opponents of the new Copyright Directive agree that the Article 13 amendments need to be elaborated, and big companies should improve systems used to detect pirated content to keep the Internet free.